I was ten years old when Roe v. Wade legalized abortion in 1973. I remember how the Catholic Church I attended, St. Jude’s, on Warson Road in St. Louis, Missouri. They spoke, organized, and released its community to celebrate and champion the gift of life. This 42 year-old life and death core value has only grown in volume and still remains the central public discussion. This irrepressible matter will not go away. The reason sanctity of life is a central issue is because it is near and dear to our Creator God. (Genesis 1:26-27) We are made in God’s image. We are his “image-bearers.” To attack an unborn child, or any “image-bearer” is to attack the image of the One who created us. Murder, suicide, domestic abuse, abortion, human-trafficking, assault, and slavery are not just a fatal offense against a person, but against the nature and heart of God. A follower of Jesus cannot say thank you for grace and then attack the giver of that grace. It is simple. We are called to love what God loves and to hate what God hates. (Psalm 97:10) As people who are called out of darkness, we speak to those still caught in darkness. To not speak is to give tacit approval. So it stands to us, people given life and eternal life, to pray, defend and cry out for the unborn and oppressed. 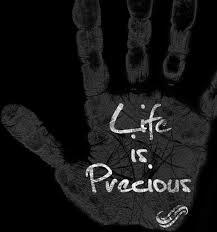 God is for life. Ultimately, because God speaks on our behalf when were are helplessly trapped in sin, we are called to those who are helpless, weak, and in deathly danger. The so-called culture of death around us now is no different from that of the past. The hostility to human babies is happening exactly the same way. The Prince of the Power of the Air excites evil passions. Satan uses Pharaoh’s lust for military stability that says, “I don’t want another king,” in exactly the same way he uses a Southern Baptist deacon’s lust for maintaining his reputation to get him to load his teenage daughter into a car and drive her under the cover of night to a clinic in a nearby city so no one will ever know she was pregnant. The blood of children flows, but the problem is spiritual to the core. The evidence of an anti-God culture is found in its fruit of death. Abortion, human trafficking, drug abuse, slavery, prostitution, and murder all stem from the worship of self rather that the Lord of Life. As a pastor I believe people know that I consistently value life. That being said, my voice has been a quiet one. While I have been consistent in caring for people, I have not been the leader I should be in championing the most important matter to the heart of God: people! Please pray for, encourage, and challenge me to use my life for the cause of life. Should Jesus Followers Be Involved in Politics? God regularly acts directly in human affairs. It is his customary practice to work through us, whether in the home, in the church, or in society. Followers of Jesus have a humble recognition that their authority has been delegated to them by God. The Holy Spirit gives a constant awareness that we are called to hold our leaders up in prayer and accountable to the office they hold. Secondly, how foolish and illogical to leave the oversight of our public life to those who have no respect for the God who grants them their authority. Jesus taught in the Sermon on the Mount, that we are “the salt of the earth” and “the light of the world.” Salt was used, in the absence of refrigeration, to arrest the spread of decay. Light to dispel darkness. When we refuse to engage, and so remove both salt and light, we ought to expect nothing but decay and darkness. 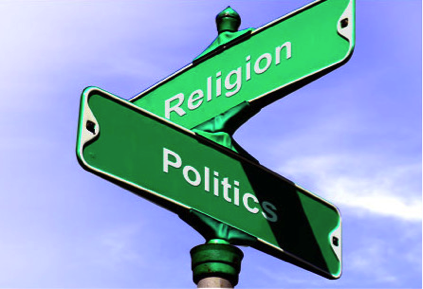 Since lawmakers hold in their hands the very power of God, Christians in truth have much more reason to be concerned about political matters than our secularist friends. People act in line with what they believe. For instance, if we believe a stovetop is hot, we will not place our hand on it. Because we believe vitamins are essential for good health, we take them. We find ourselves in trouble as we harbor felicitous inconsistencies. This is a fancy way of saying: I say I believe something, but my actions fail to align with my words. For example, I believe that it is important to exercise regularly, but I rarely make it to the gym. I believe that generosity brings joy—but I dread letting go of money or time. Do my words and actions align? 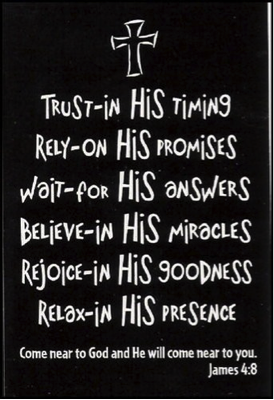 I say, “God is in control”, but I continuously worry. I state, “Honesty is vital to a relationship,” yet a tell lies and half-truths over even the insignificant. 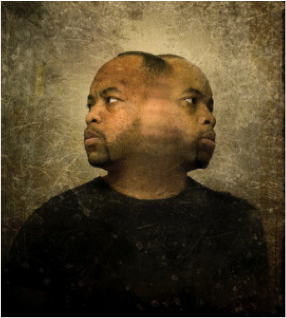 Dan Delzell shares a convicting article about what spiritual double mindedness. Read it here. During this time of Sabbatical, the Holy Spirit has pointed out several weaknesses I bring to ministry. I am convicted that my voice is weak regarding generosity. For fear of driving people away or making them feel uncomfortable, I have not adequately shepherded the community I love in this vital area of giving. God is generous. God is so generous that our ultimate Provider literally puts “skin in the game”. Jesus is God’s perfect example of being generous. The call to give our first fruits and our tithes (two different Old Testament ways of giving) come from an understanding that God does indeed “give us this day our daily bread”. It has taken years for my head and my heart to get on the same page regarding the worship of God with time and resources. Tithing, giving, and blessing are matters of worship to God. We respond to His blessings by being a blessing to others. When we respond to His goodness with goodness, we become instruments in His hand to usher in His coming kingdom. If I wonder how is my life of worship doing, the Maker of Heaven and Earth has given dashboards to quickly indicate my worship levels. When it comes to the use of my God-given time and God-given resources, my calendar and my checkbook poignantly testify to my priorities and what I am prone to worship. God’s call to receive is linked to his call to give. Generosity is a matter of the will but also of the soul! Generosity isn’t any one thing—it is everything! God’s generosity in the gift of Jesus is about life that is rich toward God. Assumption destroys relationships. Presumption builds trust. These two words, often used interchangeably, are similar but the subtle differences are significant. Both assume and presume mean “to take at face value” or “suppose,” but presume carries more weight based on past behavior or evidence. Assumption is to consider something valid without proof. Something you presume is more likely to be true than something you assume. When I assume things are good in a relationship little space is left for growth. When I presume that my friend acts out of good intention, the door is wide open for encouragement. 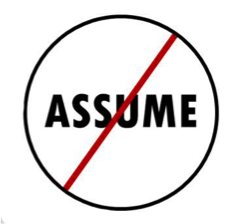 Assumptions tend to take the same old path, but presumption is like exploring new territory. The first often goes with out dialogue while the other opens the way for deeper understanding. Marriage teaches me more about myself than I bargained for. When people say marriage is hard, it is true. Never start the day off nagging or complaining. An unwillingness to quarrel about something doesn’t mean agreement. Generosity may very well be the key to all happiness. Most fights point to my immaturity. Admit my shortcomings early on. They’re obvious anyway. Being right in not as important as being righteous. Many of the things I fight hard for turn out not to have been worth the fight. Be the first to apologize. Really. It’s not as painful as it sounds. If I want something, I must recognize and accept that it’s my job to ask for it. Sometimes you’re going to do your unfair share. It’s not worth whining about. The best way to love your kids is to love your spouse more. Don’t kid yourself into thinking you have all the time in the world. “In love” pales in comparison to love. 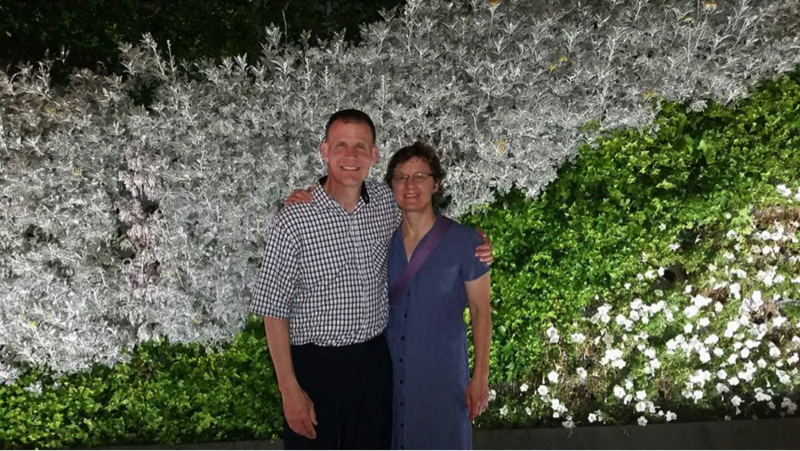 I married “up” – proof of God’s grace! Every time, every single time, I failed to heed her advice – I have regretted it! It is my job to be content, not hers or anyone else’s! During this treasured time of Sabbatical, I have been reading, reading, and reading, along with some traveling. 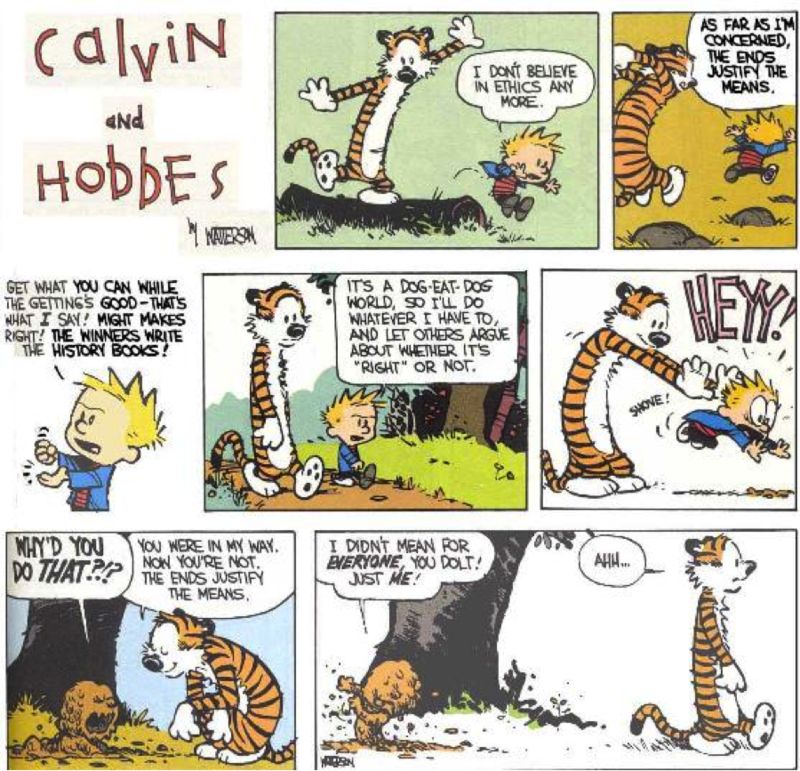 Some reading has been heavy, but tonight it was quite light: “Calvin and Hobbes.” Tonight, I came across this humorous yet poignant comic offering. 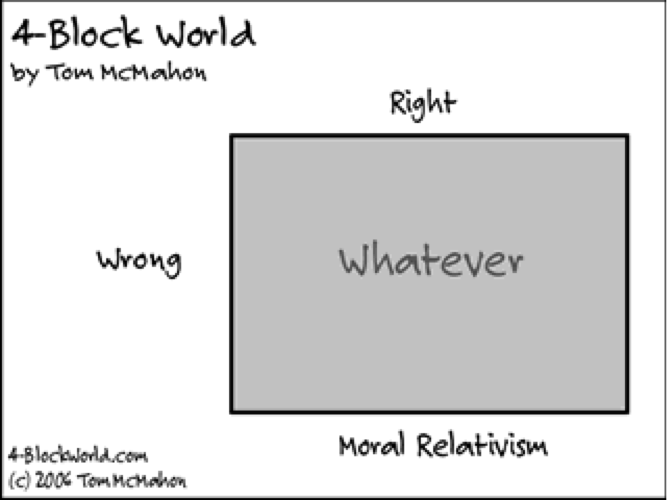 This brilliant cartoon speaks to the danger of relativism. 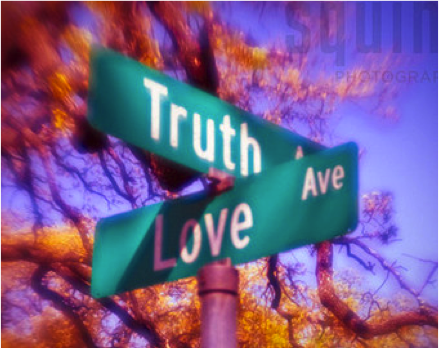 cognitive relativism(truth)–Cognitive relativism affirms that all truth is relative. This would mean that no system of truth is more valid than another one and that there is no objective standard of truth. It would, naturally, deny that there is a God of absolute truth. moral/ethical relativism–All morals are relative to the social group within which they are constructed. 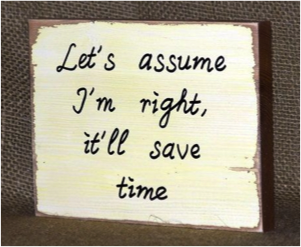 situational relativism–Ethics (right and wrong) are dependent upon the situation. I encourage you to read this brief explanation on relativism by Mr. Slick here. We are living in the dredges of multifaceted relativism. Our legal system has difficulty punishing criminals, entertainment continues to push the envelope of indecency, and schools educate students in such a manner that logical reasoning is taboo. Disagreements are seen as bigotry rather than the opportunity to challenge and improve ideas. If all moral views carry the same weight, then how do we determine punishment? If the mark of right and wrong is based on every and any individual, then the only logical outcome is chaos and degeneration.